"As an African-American and Pan-African holiday celebrated by millions throughout the world's African community, Kwanzaa brings a cultural message which speaks to the best of what it means to be African and human in the fullest sense." Created in 1966 by Dr. Maulana Karenga (in conjunction with the Organization of Us) as a way to preserve and promote African-American culture, Kwanzaa is a cultural holiday celebrated by families each year from the 26th of December through the 1st of January. Just what is Kwanzaa, and how is it observed? In this article, we take a closer look at the history and traditions surrounding this increasingly popular celebration of family, community and culture. The name Kwanzaa (pronounced KWAN-za) takes its roots from the Swahili phrase "matunda ya kwanza," which means "first fruits." Swahili is a Pan-African language, and it is the most commonly spoken language in Africa. According to the official Kwanzaa website, celebrations of the harvest in African history may be traced back to ancient Egypt and Nubia. In more modern times, these celebrations are also attributed to the Ashanti and the Zulu. Dr. Karenga combined the principles of several different harvest festivals to create the basis for Kwanzaa. Nguzo Saba, which means "seven principles" in Swahili. Each of the seven days of Kwanzaa emphasize a different principle. Unity: Umoja (oo–MO–jah) This principle calls on observers to work towards unity of the family, the community, the nation, and their race. Self-determination: Kujichagulia (koo–gee–cha–goo–LEE–yah) This principle calls on observers to define and name themselves, while also striving to create and speak for themselves. Collective Work and Responsibility: Ujima (oo–GEE–mah) Through this principle, participants dedicate themselves to building and maintaining their community by working together to assume and solve the problems of their brothers and sisters. Cooperative Economics: Ujamaa (oo–JAH–mah) This principle calls on observers to build and maintain their own stores, shops, and other businesses, and to profit from them together. Purpose: Nia (nee–YAH) Through collective effort, the observers should work toward the building and developing of their community in order to restore their people to their traditional greatness. Creativity: Kuumba (koo–OOM–bah) Through this principle, the people are asked to work together to make their community more beautiful and beneficial than it perviously was. 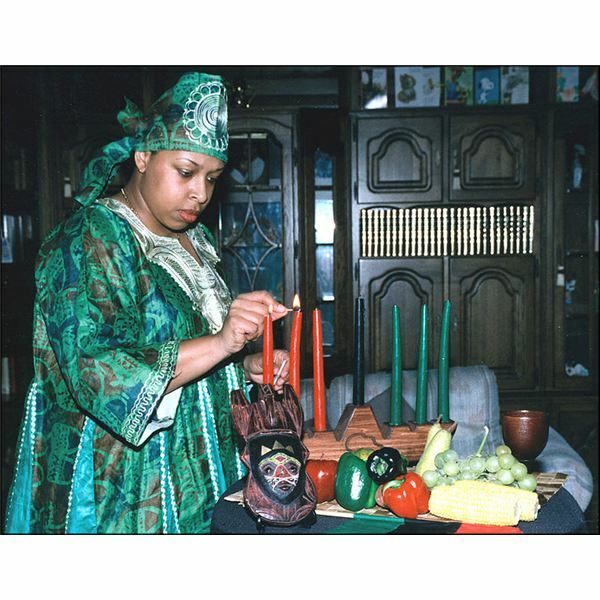 Kwanzaa celebrations often include songs, dances, African drums, storytelling, poetry reading, and a traditional meal. Center to the celebration is the Kinara, which is a candle holder. On each of the seven nights, family gather, and a child lights one of the candles (beginning with the black candle in the center). Afterward, one of the seven principles is discussed. On December 31, an African feast (called a Karamu) is held to symbolize the conclusion of the holiday. Mazao (The Crops) The basis of Kwanzaa is celebration of the first fruits. Likewise, harvest celebrations recognize the rewards of the productive and collective work of a community. Mkeka (The Place Mat) Typically made of straw or cloth, the mat is symbolic of the foundation of history and tradition the community is built on. That history is studied as observers help to shape the future. Kinara (The Candle Holder) The Kinara is thought of as the "center stalk," and represents the ancestry from which observers came. Mishumaa Saba (The Seven Candles) The candles are used to represent the seven principles (Nguzo Saba). There are three red, three green, and one black. The back candle sits in the center, and is lit on December 26. The three green candles represent Nia, Ujima, and Imani. They are placed to the right of the Umoja candle. The three red candles represent Kujichagulia, Ujamaa, and Kuumba. They are placed to the left of the Umoja. One candle, representing one principle, is lit each day and participants discuss what is Kwanzaa and how the candle relates to the celebration. Kikombe cha Umoja (The Unity Cup) The kikombe cha umoja is used to perform the tambiko (libation) ritual during the Karamu feast. During the Karamu feast, the cup is passed to observers, who drink from it as a remembrance of the ancestors and to promote unity. Zawadi (The Gifts) On the seventh day of Kwanzaa, gifts are given to reward accomplishments and commitments kept. Often, these gifts are handmade. 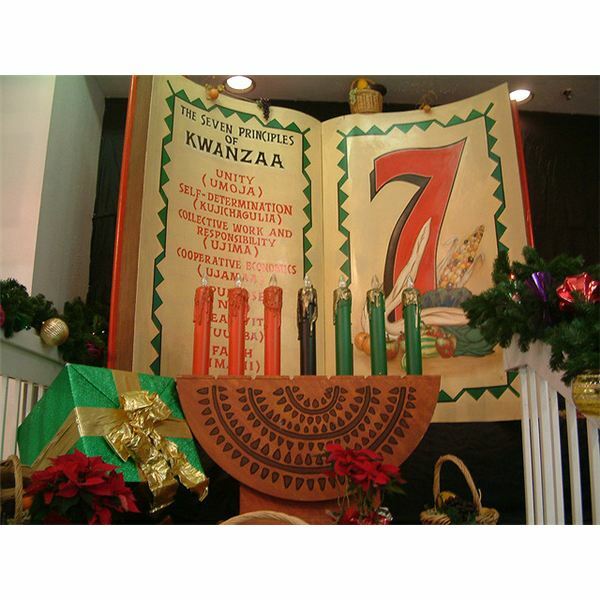 According to the official Kwanzaa website, gifts "must always include a book and a heritage symbol. The book is to emphasize the African value and tradition of learning stressed since ancient Egypt, and the heritage symbol to reaffirm and reinforce the African commitment to tradition and history." Also used during the celebrations is the poster of the Nguzo Saba, or seven principles.